With each passing day, director Hansal Mehta seems to unravel many layers from his film Omertà. You saw Rajkummar Rao playing the dreaded British-born Pakistani terrorist Omar Saeed Sheikh deep in prayer in the first poster. Omertà's second poster shows a bearded and remorseless Rajkummar Rao being taken away in a police van. Whether this was soon after his capture by Delhi police for the kidnapping of four foreign tourists or for his ruthless killing of Wall Street Journal reporter Daniel Pearl, we will know only after watching the film. A defiant, nonchalant Rajkummar Rao can be seen almost smiling in the poster. ‘My first as an anti-hero and exhausting as an actor. To feel the hate towards another human-being without any remorse can take quite a toll. It took me a while to shed this character,” says Rajkummar Rao. Today's poster along with the first poster of Omertà released yesterday gives a clear indication that the filmmaker along with his muse Rajkummar Rao are set to break new ground again. Omertà is the horrifying true story of one of the most dreaded terrorists of our times. Shot in real locations across London and India, Hansal Mehta's Omertà exposes the real and present danger of Pakistan sponsored terror. 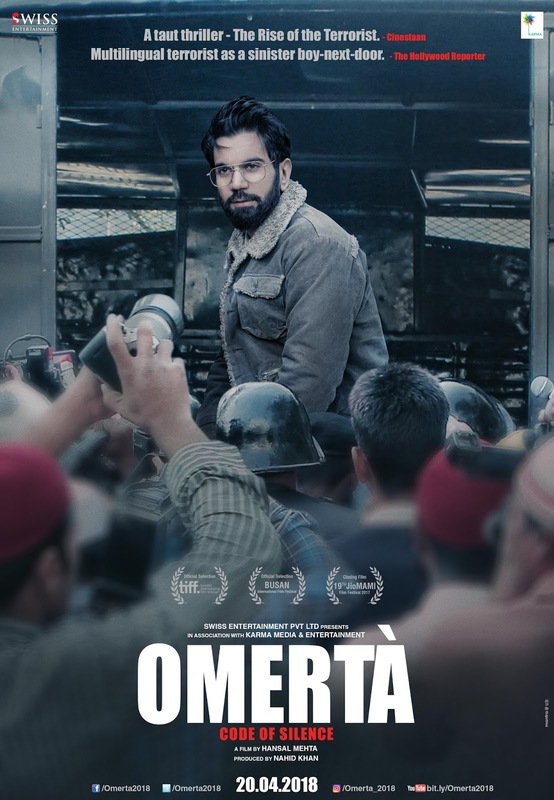 Woven around some of the most bloody terror attacks in recent history including the 9/11 world trade center attacks, the Mumbai Terror Strike and the brutal beheading of American journalist Daniel Pearl, Omertà is a thriller that looks into the journey of an evil mind. The film premiered to excellent reviews at the Toronto International Film Festival 2017 followed by the Busan International Film Festival and a very successful screening as the closing film at the Mumbai Film Festival 2017.